My oh my, Dora's about to take a fun trip to... Candyland! She's so looking forward to it, she's already imagining herself enjoying all those mouth-watering lollipops, all those eye-tempting candies and chocolate bars. Till she leaves for sweets' dreamworld, she would very much like to get herself a sweet chic, lovely candy girl look! 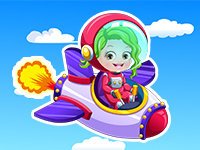 In no time you'll qualify this game as one of the sweetest free doll dress up games you've ever enjoyed! Come up with a sheer cute make-up look for her, get her an adorably chic haircut, too, then scan through her pretty baby doll candy-colored dolly dresses, through her sweet flouncy girly miniskirts, chic shorts or knee-length leggings and lovely tops, dig through her sparkly jewels and baby doll shoes and get her a super cute look, the perfect one for her awesome trip to candies' magic land! So, are you ready to add some style to Dora's dream trip to Candyland?